The mystery regarding what happened to the inhabitants of Abandon mining community a hundred years ago, is one that is yet to be solved. The mining community just suddenly disappeared on Christmas day, leaving all their worldly goods with no evidence as to what happened to them. Two guides are hired by a history professor and his daughter, with them are a couple obsessed with paranormal photography who believe that Abandon is haunted. Once there, the party discovers that they are not alone but it's something far worse than ghosts. Once I got about a quarter of the way in I was totally hooked on the story and finding out what was happening in the alternate story lines, one dealing with what happened in 1893 and the other with the present day expedition. I thought this was going to be a paranormal read but it turned out to be something very different and although I was a bit disappointed that the storyline didn't make better use of the paranormal couple it was still completely engrossing. 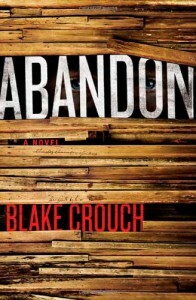 Another really solid read from Crouch.